I can’t believe another year has gone by. It seems time is speeding up and the days are getting shorter. I know it’s almost cliché for an author to say this year has been one of the best so far and that I’m blown away by the success my work has achieved—but it’s the truth. I’ve always had an over active imagination and been an avid bookworm. My passion for lyrical sentences and storyweaving was ingrained into me right from a little girl, but I never had the guts or motivation to try and see if I could chase my ultimate dream. There were many times in my life that I would think—I would like to write. And then real life like bills and things would get in the way. Then one morning, out of nowhere, I sat up in bed and announced to my partner (hubby to be) that I wanted to write a book. That night we went to see Avatar in 3D and my mind exploded with how amazing and visual the special effects were. It really impassioned me to create something vivid and real. To paint a movie in people’s heads and prove to myself I could do it. So, the four year long journey began. That next day we went to JB Hifi and bought my first laptop. And I became obsessed. I went from running my own business, and living a life already full of work and commitments to being consumed by that tiny laptop and word document. Honestly and truly. It was drivel. I dumped too much backstory. Told the story and didn’t show. My grammar was all over the place and the characters card board cut-outs. Terrible. I got disillusioned and gave up. Hubby noticed I wasn’t glued to my laptop and asked why I’d stopped. When I told him I sucked and I was kidding myself, he yelled at me. Literally got all angry and threatened me to finish what I started—that he believed in me. He’d never been so angry with me before and it kinda pissed me off. It was my dream—not his. If I wanted to quit, he should let me. But his asskicking was what I needed and the little voice in my head forced me back to work. I then found Query Tracker online and met a bunch of amazing authors all learning, and slogging through the process of conjuring a story. We banded together and critiqued each other’s MS’s until we found our voice and I grew to believe in myself. It wasn’t an over-night success. I’d like to say that when I published Tears of Tess in September that it was the course of quick success, but it wasn’t. I taught myself from the ground up on how to write a believable story. For four years, I wrote and wrote and wrote. I did nothing else in my free time. I annoyed myself with how much I thought and breathed writing. And then two characters sprang into my head and it was like a key unlocked in my brain. Tess and Q were so REAL and their story poured so quickly. Seven weeks from opening a blank document to pressing the publish button. But that skill of writing fast didn’t come from overnight. It came from an obsession that I would never give up until I succeeded. And for someone who flunked English and left school at 16, I was pretty damn proud when reviews started coming in that people actually liked what I had to say. 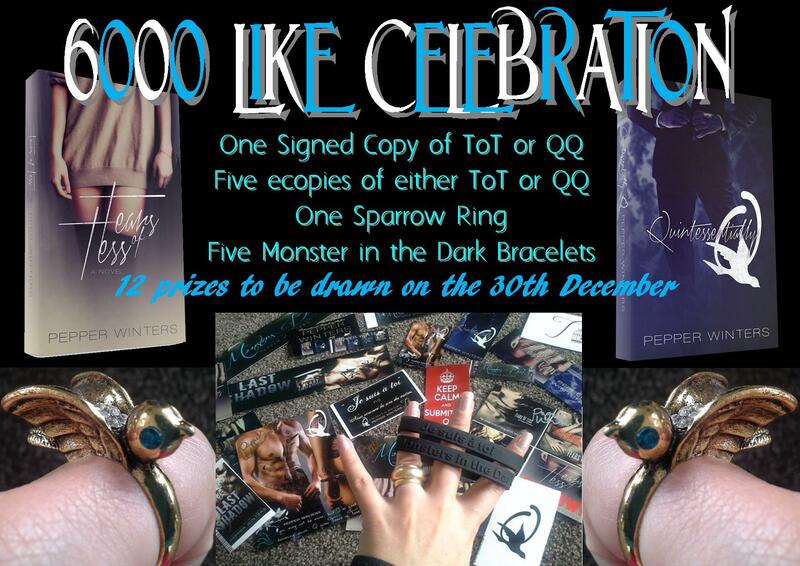 I wrote Quintessentially Q in six weeks and was over the moon that fans of Tears of Tess liked QQ even more! It made my year. This last few months proved to me that if you chase your dream, ignore your fears, and never give up, all your aspirations can come true. Tears of Tess has been nominated on so many bloggers Top 2013 Reads I can’t keep track. I get tears in my eyes every time I get tagged in some amazing post alongside other INCREIBLE writers. Tess became an international bestseller in five days after publishing. Agents started emailing asking if I’d like representation. I sold print and ebook rights to a Turkish Translation publisher. I received so many AMAZING messages that I couldn’t believe this had really happened to me. It all feels surreal. Still does and probably will forever. The message of this long post is—I never stopped fighting for what I wanted. I wanted to be a bestseller, I wanted to write a book people enjoyed, I wanted to be unique, be known for being a good writer, and carve a small niche for myself in literary heaven. And I did that. So if you’re a seasoned writer congratulations on chasing your dreams. If you’re yet to press publish—never stop striving. The best things only happen when you fight for them. And I’ll never stop fighting. Never stop learning, growing, writing. But none of my success would’ve been possible without the AMAZING support of bloggers and reviewers who helped spread the word of Tears of Tess. I couldn’t have done this without the amazing readers who gave an unknown author a try and bought her book. Who left reviews, and spoke highly of it to their friends. The word of mouth Tears of Tess received was invaluable to its success and that is priceless to me. Thank you to all the other awe-inspiring authors I call friends, who let me into this dream-like world of books, writing, and all things character-love. Thank you for every message, every tweet, and comment. I will never stop appreciating every single reader and always be humble that people enjoy my work. 2013 made my dreams come true, but 2014 will bring everything my heart desired: To have the courage to call myself a writer. Up till now—even with the sales of Tess and QQ, I still felt unworthy of calling myself an author. If someone asked me in person what I did, I didn’t mention it. I don’t know why, but I always felt like I still had more to prove. But now, thanks to you, I have the courage to call myself a storyteller first and everything else that I am second. I am a writer through and through and will be until my last breath on this earth. To find your true calling, your reason for existing and be able to do it is the best gift on earth. So thank you universe. Thank you everyone. Just thank you. To wrap up this post I’m also mentioning the winners of the 6000 Like Facebook Giveaway! Thanks to everyone who participated and congratulations to the winners! Wow, thanks for sharing! I’m so happy for you; tell your partner, your fans say THANK YOU, lol. Keep writing, and I’ll definitely keep reading! I could very vividly imagine “everything” that happened in both books. You have a very special gift, and I love it. Happy New Year!! I hope it’s a great one for you!! Such humble person you are. you deserve your success..i’m glad you did not give up 🙂 i actually ended up the year reading tears of tess and started 2014 with QQ even tho it was midnight. continue pursuing your dreams pepperwinters.. we will be supporting you. Good day. Your an amazing writer Pepper! Thanks for sharing your experience with us. I love your books! Happy New Year and Cheers to another fabulous year! Thank you so much, Grace. 🙂 I’m so glad you liked them! !